Spring cleaning- don't you love it? I do- it's good motivation to finally go through my stuff and get rid of the clutter that's been intruding in my life. I went through my children's toys and sorted them out and took ot the things they never used, and then the rest, made sure to dedicate enough containers for the things they used most often. 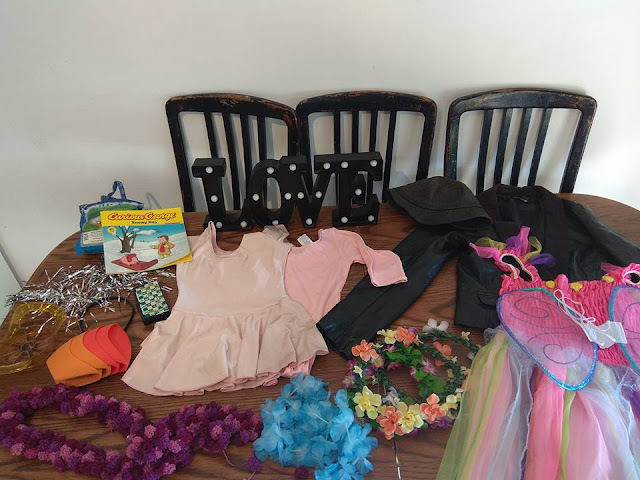 My kids love dress up and costumes and other make believe things, so 3 out of 8 of their boxes of toys have to do with dress up and make believe. I also decluttered my clothing. I had so many pieces of clothing that I had just sitting in my bedroom, that didn't even fit with my clothing, that I never planned on wearing again (mostly sweaters in colors I realized were not flattering on me). And then there was some clothing that got passed on to me as hand me downs but my children weren't going to wear. I was loathe to actually get rid of the clothing and toys, because they were good quality and even though I didn't want them, they were too good to throw in the trash. While we have a second hand store in my area, it's a pain to get to, and the hours are confusing for me, so I just never bring anything there. I was really excited to hear that there was a clothing swap in my neighborhood. There have been others in the past recently, but the timing never worked out for me and therefore I didn't make it. 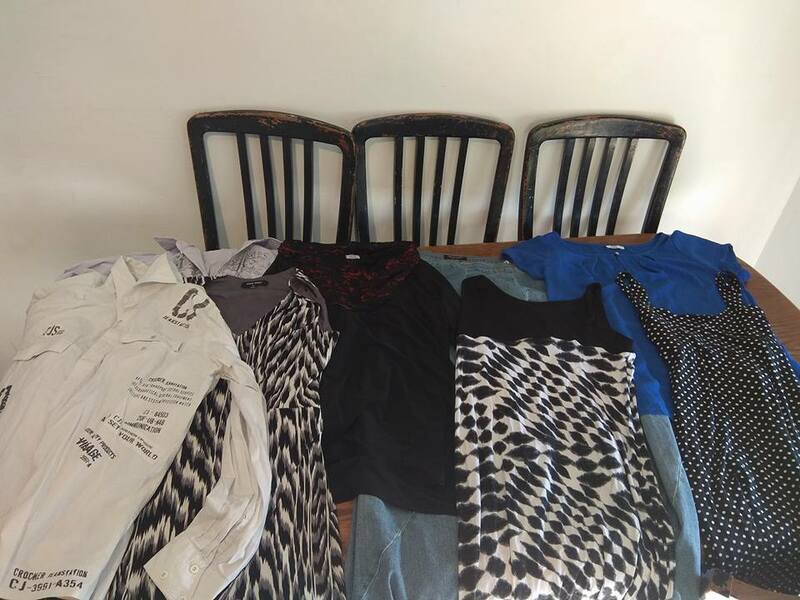 But this swap was supposed to be a big one, and I loaded up my shopping trolley with all the clothes and other things I was getting rid of, and headed over with my eldest son Lee (the other kids were in school). 4 skirts for my girls- two that would fit Anneliese, one that would fit Rose, a t-shirt for rose, a cute peasant shirt for Anneliese, two pairs of shoes for Anneliese, a sweatshirt for Ike, a pair of pants for Anneliese, pajamas for Anneliese, a coat that is in perfect condition and Anneliese would need to grow into it, but otherwise pretty amazing, and a lace shirt for Anneliese to grow into as well. 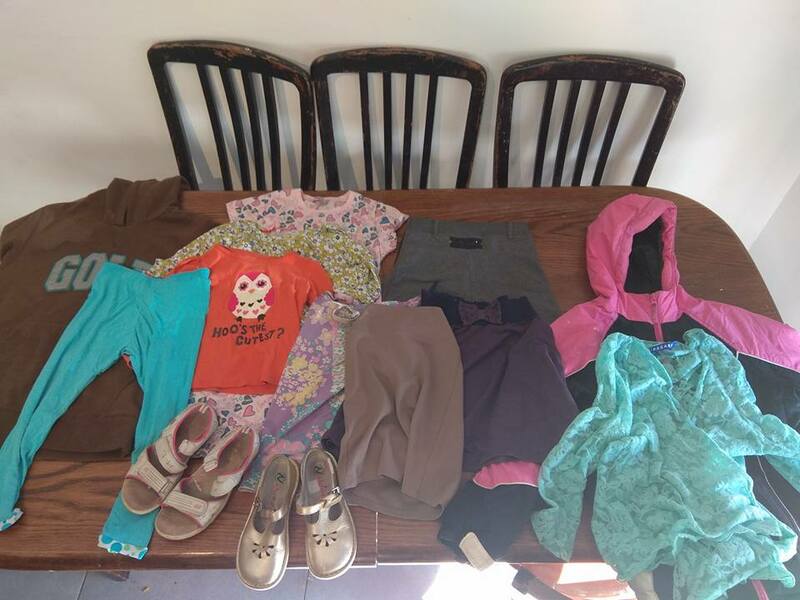 Not shown in this picture were two dresses, one for each of my girls, that my daughters insisted on taking out of the pile of clothes before I managed to take a picture, and insisted on wearing them to school today. I got two button down shirts for Mike, a skirt, two shirts, and three cute dresses for myself. And then there were all these odds and ends. Most of them costumes. Like this leather jacket that would be amazing for dressup. And this fairy costume. And flower crowns. And flower necklaces. And two leotards. And a funky hat. A fun scarf. A cute "love" sign. An apple cutter. A bunch of silicon hot mits. Some funny antena headbands. And a kilo package of rice. I'm not sure why someone was giving that away, but ok. And Lee saw this snakes and ladders game and asked me to get that for him, as well as this Curious George book. (He reads on a much higher level than that, but I think he wanted to be able to read it to his siblings.) There was also a bouquet of fake flowers that my daughters took to school today. Lastly, Lee found a pair of aviator style sunglasses and he hasn't taken them off since. The way this swap worked was that everyone brought stuff, they were sorted by type, and then you can take as many things as you want. There was a 2 dollar entrance fee that went to charity. And I got all this stuff. And the best thing is honestly the shoes. Because I needed to get Anneliese shoes because she outgrew her old ones, and I just brought these home hoping they'd work and it was a perfect fit. The shoes were barely used so I'm not concerned about giving her someone's old shoes. Do you ever go to any clothing swaps, either lately, or ever? Does a clothing swap seem like something you and your community would enjoy? Got any frugal clothes or free things lately? What were they? What a great way to do things!